Saturday was one of those days that make college football so enjoyable. That was just a prelude to Saturday, when the game of the year took place between Alabama and Auburn. 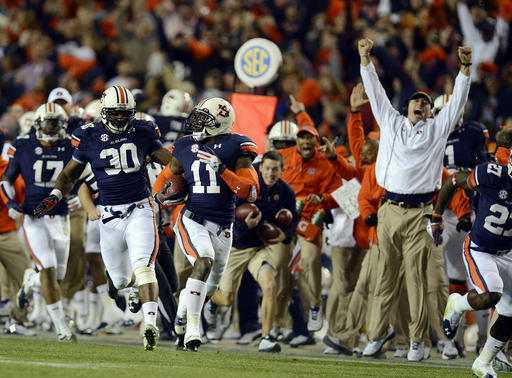 The Tigers took down the defending champs in the most improbable way possible (and aided a bit by Alabama coach Nick Saban’s hubris), as Auburn’s Chris Davis returned a missed 57-yard field goal the entire length of the field for the game-winning score on the final play of the game. It’s a bit surprising that Saban called on freshman kicker Adam Griffith to try and win the game rather than let quarterback AJ McCarron try to win the game on a Hail Mary attempt. McCarron had already thrown for three touchdown passes – including a 99-yard touchdown pass to Amari Cooper, confirming that McCarron has the biggest balls in college football. Alabama’s loss opened the door for Ohio State, which befitting the Big Ten’s status as the junior varsity to the SEC’s varsity, played Michigan earlier in the day. In a surprisingly entertaining game, the Buckeyes survived as Michigan missed on a two-point conversion with 30 seconds to go. Ohio State won despite allowing 20 fourth-quarter points and more than 600 yards of offense to a Michigan team that came into the game as the 99th-ranked offense in college football, and came within one play of losing to Akron of all teams earlier in the year. It was also the sixth time this season that Ohio State gave up more than 21 points in a game. The Buckeyes entered Saturday hoping that either Florida would do a solid for the former coach that quit on them and beat Florida State, or that Auburn would take down Alabama. The former didn’t happen – the Seminoles rolled to another win – but the latter did and now things get interesting. When the latest BCS standings are released tonight, Florida State should be an easy No. 1 with a comfortable margin over Ohio State at No. 2. Where the intrigue lies is how tight the gap will be between the Buckeyes and Auburn at No. 3. If it is close enough, it is conceivable that the Tigers could pass Ohio State after their respective conference championship games next weekend. Ohio State will face a Michigan State team that inspires no one, while Auburn will take on Missouri, who could come into the game at No. 4 in the BCS standings. Auburn carries with it the cache of the SEC – a conference that has produced the national champion for seven consecutive years – while Ohio State carries one national title in the past 43 years. If Auburn takes care of Missouri a week after taking down the Crimson Tide, while Ohio State has a close win against the Spartans, it could be enough to sway the minds of voters. This weekend reinforced the advantage that college football has over college basketball, where top teams can lose during the regular season without repercussion because they know they will still receive an invitation to the tournament come March. There is no such luxury for teams like Alabama, Florida State and Ohio State, who know that one slip up can cost them everything. As nice as it will be to finally have a playoff in college football next season, the playoff will take a little bit of the edge off the regular season. As exciting as this weekend was, in the end it set up would should be an even bigger weekend of games come Saturday. It was one of those days for Liverpool on Sunday. The day started out with the news that forward Daniel Sturridge, who has 11 goals in 14 matches this season, will be lost for up two months with an ankle injury. Things only got worse when the Reds took the field against Hull City, who entered the match losers of four of their past five, including a loss to bottom-of-the-table Crystal Palace. But 90 minutes later, Liverpool left the pitch on the wrong side of a 3-1 defeat, the first time they have ever lost to Hull City. In the process, Liverpool lost more ground to Arsenal, which now sits seven points clear at the top of the Premier League table. It’s one thing to walk away with a draw against Everton in last week’s derby – rivalry game, you know – but it’s another to drop points against Hull City. Liverpool has only taken four points in their last four matches and now have to deal with the loss of Sturridge, who has been a solid compliment to Luis Suarez as a goal-scoring option. The fear here is that, without Sturridge to help carry some of the load, Suarez will try to do too much and that will lead him to become frustrated and start doing Luis Suarez things, which is not good. With six games coming up this month – including matches with Manchester City and Chelsea – Liverpool manager Brendan Rodgers needs to come up with some options in a hurry. Who is going to be in the Tribe’s bullpen? It kind of went by quietly, but reliever Joe Smith signed a contract with the Angels this week, creating another hole for the Indians to fill in the bullpen. The Tribe was already in the market for a closer after releasing Chris Perez a few weeks back, and now they need to find a replacement for the reliable Smith, who spent five mostly solid years in Cleveland. The Angels gave Smith a three-year deal with the Tribe was reportedly only willing to go two years on a contract. It will be interesting to see what the Tribe does to fill the vacancies. One option is Vinnie Pestano, but who knows if his 2013 performance was just one of those years or the start of something worse. If it turns out that Pestano can’t return to his 2012 form, that would present another problem. It’s a little surprising the Indians wouldn’t (or couldn’t) give that third year to Smith. With so many questions already surrounding the bullpen for 2104, it seems like giving manager Terry Francona at least one reliable arm would have been worth an extra couple of bucks.